Since the iOS 11 was released, many iPhone 6S/6 users just cannot wait to experience the cool features of this new software version in advance. However, some users sadly found out battery draining a little fast on their device after update. Luckily, this article will offer some useful tips to help you extend iPhone 6/6s battery life on iOS 12/11.4/11.311.2/11. When battery draining fast on your iPhone 6S/6, check what apps is the top power-consuming apps on your device. You can close the app; turn off notifications or background refresh to increase iPhone 6 battery life on iOS 11 and iOS 12. Go to Settings -> General -> Battery. Scroll down to see what’s the biggest battery drainers in the past 24 hours or last 7 days. Sometimes if the screen is too bright, the battery will also go down quickly. Thus, it is suggested to turn down the brightness on your iPhone 6/6S a little. Low brightness is also help to protect your sight. Go to Settings -> Display & Brightness, adjust the brightness slider to turn down the screen brightness. When the Background App Refresh is enabled, it allows apps to refresh their content when connected to network, which will consume much iPhone battery. Thus, disable Background App Refresh will be an effective way to save more battery life on iPhone 6/6 Plus/6s. Go to Settings > General > Background App Refresh, tap on the option to disable this feature. You can also keep it on but close the apps you don’t use frequently to save iPhone battery lifespan. When there is too much cache file accumulated in an app, every time you launch it, it will load these data too. The more junk files in an app, the more power will be consumed. It’s really necessary to clean out junk files to maximize iPhone battery lifespan. You can try an easy tool called Free iCareFone Cleaner. This all-in-one iOS caring software is able to clear all the temporary files, caches, large files and other unnecessary data easily. Locations service is also the top power consuming apps. It is used in a lot of situations, like locate a restaurant, exact driving directions and more. 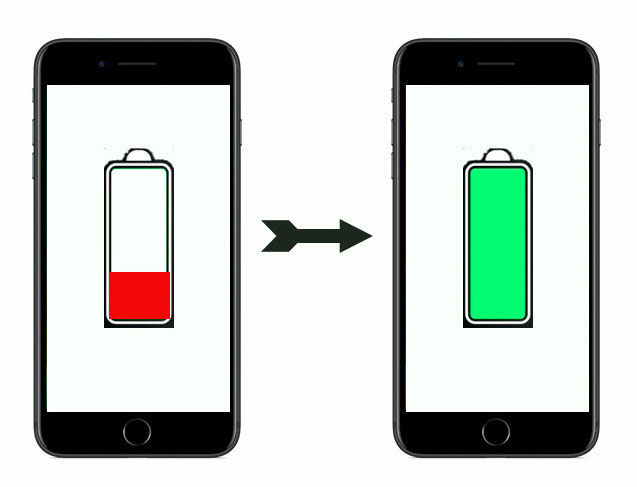 You can turn off this feature to save battery power on iPhone 6/6S easily. Go to Settings -> Privacy, click “Location Services” to close it. Many people usually forget to turn off Wi-Fi and Bluetooth when they are not using. This makes the Wi-Fi and Bluetooth keeps searching network and other devices and dies iPhone battery faster. Swipe up from the Home screen, turn off Wi-Fi and Bluetooth when you are not using them. Another easy tip to prolong battery life on iPhone 6 with iOS 11 is to set iPhone to check email accounts manually or less often. Open Settings app, choose Mail -> Accounts -> Fetch New Data. Tap on the Push option to close it. You can also set the period of mail fetching to Hourly or Manually. When you are not using iPhone, it will go to sleep in a few minutes if you have set the auto-lock. The sooner it sleeps, the less power is used. Tap Settings -> Display & Brightness -> Auto-Lock, and then choose your preference. The above are all the tips and tricks we’ve gathered for saving battery on iPhone 6s/6 after iOS 11 update. More iOS 11 battery drain fixes are here.